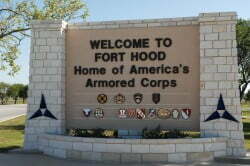 At the end of the last post I left you hanging at the gate of Fort Hood wondering if that was actually my Mom and Dad at the gate trying to get in. As we get closer I still can not tell because of the lights and the darkness, but we had to make a decision in a hurry because the car was leaving. 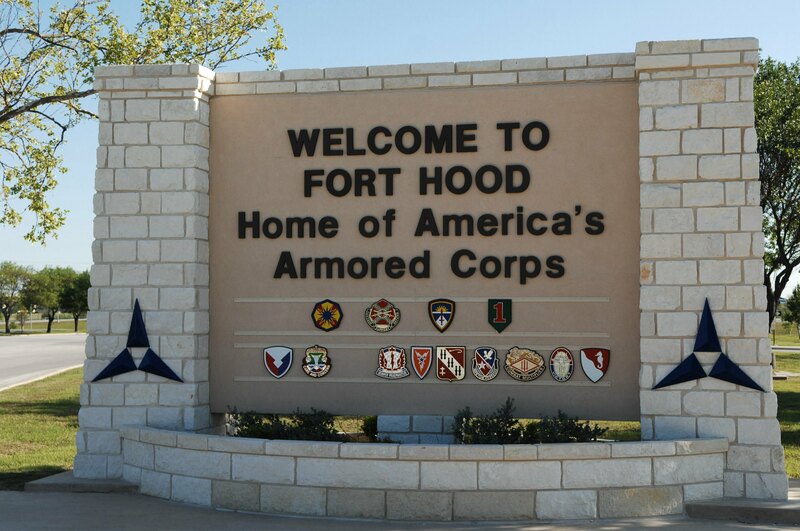 The guards were turning it around because he did not have a pass or military ID card. The taxi driver had turned around and was heading back towards the gate, but I couldn’t see into the window good enough to tell if it was my Dad driving. The car left. When the guard came up to the window, the taxi driver asked if it was an older man trying to get on to pick someone up. It was. I told the guard that he was looking for us. It was too late, the car was gone. My Dad does not have a cell phone, so I made the decision for the taxi driver to try to catch him on the highway. The ride in a taxi all the way to our destination would have been about $80, according to the driver, and all we had left was $20 and some change. So the guard let us turn around right quick and we headed for the highway to try to catch them before the meter hit $20, all the time not being 100% sure it was even them. 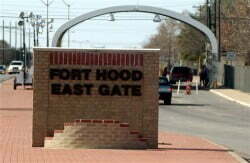 This gate (East Gate) is where we were when all this took place. I don’t remember my Dad being a very fast driver, but this car was sure moving fast, at least it seemed so as the meter kept getting higher and higher. Finally, around the $18 mark, we catch up to the car we believed to be the one that left the base. Thankfully if was my Mom and Dad, but now we have to get them to stop and pull over. The taxi pulls up next to them and I’ve got just about my whole upper half of my body hanging out the window trying to flag them down. I’m flapping my arms like a crazy man and finally when I think I got their attention, we, being in front of them by now, pulled over and hoped that they we would also pull over. They did, but they really did not know it was us until I got out of the taxi. I found out later that my Mom is the one that actually saw us and my Dad decided to pull over to see what the fuss was all about. In the process of all this the meter went up to $20 and something. I was not sure of the exact amount over $20 we had in the account for the check card, so I wanted to use the card for the $20 and give him the rest in cash. He says he can’t do it that way, if must be all one way or another. So I asked my parents if they had any cash, but they only have about $14 with them. The driver decided that he didn’t want to stay out there all night, so he went ahead and did it with the $20 on the card and the rest in cash. I should have given the guy a tip for running them down, but I didn’t. At the time I was only thinking that we finally made it and I can finally get a decent nights sleep. So off to my parents apartment we went. Before we went to bed, my Mom decided to give us our Christmas and my birthday present. It was $20 for each. She doesn’t like to send it in the mail, which is illegal anyway. We had a lot of things to do while here, but we would worry about those tomorrow, tonight it was time to sleep. The next morning Lita and I are up around 0645. She wants breakfast and in particular wants a breakfast taco from our favorite Tex-Mex restaurant, Salgado’s. It’s only about 1/2 mile or so from the apartment, so I walked there. I got Lita her barbacoa taco with egg and cheese but I got myself a breakfast burrito with migas, cheese, potato and bacon (my favorite breakfast burrito). It took the owner a couple of seconds to remember me, since I haven’t been there in 2 years, but when she did, she was happy we were back. I told her we would be back later to eat a bigger meal. Since it was Friday, they did not close until 8:00pm. Normally they close at 3:00pm. I’m hoping we do make it later because I would like to have some enchiladas. It’s all going to depend on how the day goes, how we feel and if any problems arise. We have quite a few things to accomplish while we are here and it’s hard to know where to get started. We need to take care of the storage, get Lita’s social security started, exchanged most of our pesos and all our won to dollars (if we can), see the grandkids and sell our storage things. I suppose the first thing we need to do though is see about getting a vehicle. I hope that the guy that told me he would let us borrow a vehicle is true to his word. He’s a pretty cool dude, so I’m not expecting any problems. I believe that when he says he will do something, he does it. Getting in touch with our son proved to be a problem because no one knows where he lives or his phone number. He and his family have isolated themselves from the rest of the family for awhile. I’ll just contact him on Facebook again and get the information we need to get in touch with them. He has moved from the last house I knew about and the old phone number no longer works. I’m sure it won’t be too difficult to get the information though. My Dad brought me by the bank to get the pesos and won exchanged. I called them before we left to make sure that they would do it. For P8100 I received $174.30, so a buying rate of P46.47 per dollar. For the 21,000 won I received a little over $16. Shortly after we got back from the bank, my brother came over. He is the first of my siblings that I have seen. He lives in the same apartment complex, so it’s easier for him. I’m hoping to see our son, grandsons and my sisters later. I suspect that they will migarte this way once they know for sure we are here. A little later I walked over to the new HEB Plus store to buy a gallon of milk for my Dad and I and some mushrooms for Lita. It’s only about 3/4 of a mile from the apartments. Later in the day Lita went there also with one of our Filipino friends and she bought some steak, potatoes and rice. Tonight we will be having grilled steak, baked potoates and green beans. There would also be steamed brocolli and sauteed mushrooms, but I won’t be eating those, so they don’t count. Mostly this day, we slept. The jet lag was still doing a number on us. Tomorrow is when my Dad would be bringing me down to see about getting the vehicle. I’m hoping for a pick up truck so we will have something to get the things out of storage with, but I know that beggars can’t be chosers. I would have been grateful for any working vehicle we received, but I wasn’t expecting what happen. I’ll let you in on it next post. Hi JJ ! Great to see you made another post, seeing that you don’t have unimpedd access to a PC. Still following your exploits and really hoping everything works out for your and Lita. Keep us posted. 🙂 Salamat ! Just wanted to say I appreciate hearing about you moving about, I have been checking the site every few days or so. Also, your website has been tremendously helpful while I’ve been in Calbayog–thank you for all the good work you have done on it! Howdy Nolan. I’m glad you like the website and it has helped you out. Sorry it is not more current. We should be returning to Calbayog soon, depending on what my doctor says, and I will have it better than ever. I am due to update the hotel rates this month, so I’ll have to get to work on that almost as soon as we arrive back.